If you’ve crawled under a rock recently, you may not have noticed the dramatic growth of Facebook Live and live streaming. For everyone else, it’s no secret. I’m going to share with you exactly what you need to know about the available Facebook Live tools, as well as some tips and tactics that will help you succeed with your next Facebook Live broadcast. What are the bandwidth requirements for live streaming? Your internet connection will have an upload speed and a download speed. To check your speed, use Speedtest. When you are watching a live stream, you want to have a high download speed. 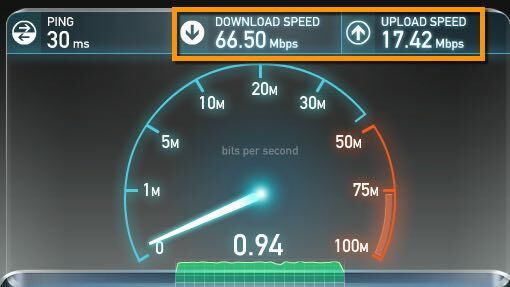 When you are streaming, you want to have a high upload speed. 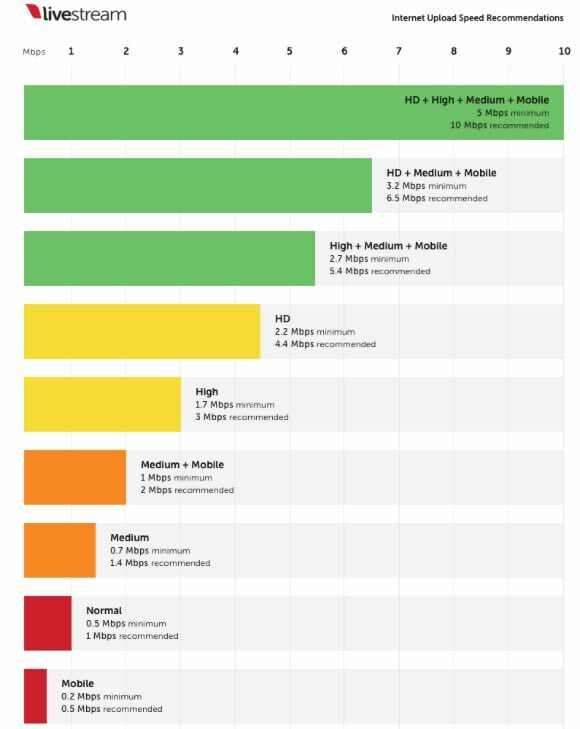 Livestream, who are in the live streaming space, recommend that if you are streaming HD (high definition) video, you need a minimum upload speed of 5Mbps but ideally you will have at least 10Mbps. No matter what your internet provider tells you, there will always be fluctuations in the available bandwidth so you’re better off having as much as possible. …as long as you broadcast using SD (standard definition) and accept there’s probably going to be some hiccups and delays. There are multiple factors that affect the amount of data you are transmitting as you are live streaming. We are assuming you are live streaming both audio and video! SD/HD – The difference between a SD (standard definition) display and HD (display) is really the quality of the image. You get a much crisper image with HD but SD is still good quality. Standard definition transmission is normally 720×480 and HD can go up to 1920 x 1080. Let’s not worry about 4k video yet!! Frame rate – This is the number of frames that are transmitted per second. If you’re doing an interview series, the standard 30 frames per second is perfect. But if you want to live stream a football match where there’s a lot of fast moving activity and you’ll want to use 60 frames per second. So… you’ll end up with double. Encoding – When you transmit data, it is encoded. The normal encoding used for live streaming is H.264. When you use this, it can be displayed across most devices. When you are live streaming, you’ll see some of these settings in the live streaming services so it’s important to know the basics. If you don’t… then you may end up transmitting HD using a 60fps (frames per second) across a slow mobile connection!!! 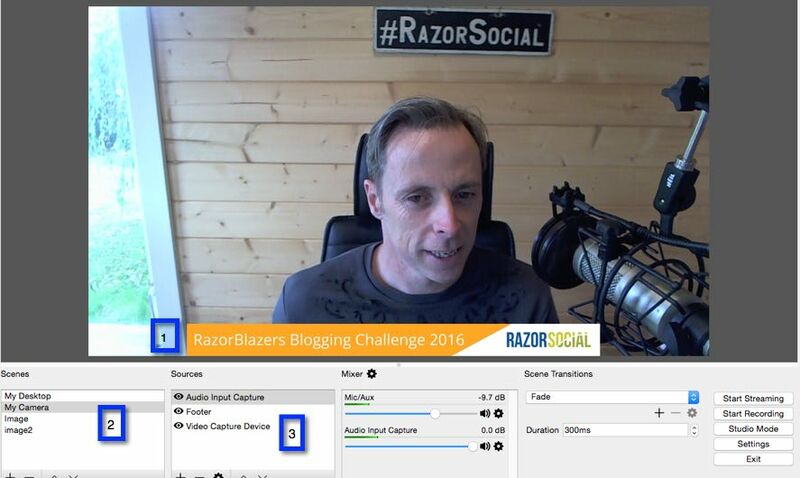 What hardware do you need to live stream? When it comes to equipment for Facebook live, there’s no shortage of tools. Let’s start off with live streaming from your office. What you’ll you need to get started is an internal mic on your PC and an internal camera. You click a button and you’re up and running. Nothing wrong with this set up. If you want to take it up a notch, you can buy an external mic and maybe even an external camera. 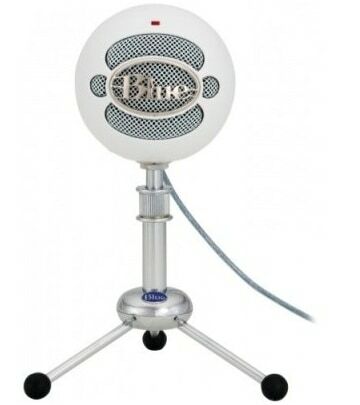 You could use the Blue Snowball USB mic and the Logitech HD pro C920 camera. You now have good high-quality video with good sound. Logitech HD Pro C920 – This sits up above me because, when I’m recording, it looks so much better when the camera is higher than you. Note: No one is perfect; you’ll see that I have my monitor sitting on a pack of paper and a file!! What about live streaming from your mobile device? The most basic set up is taking out your mobile and broadcasting but you may want to have a couple of extra bits and pieces. 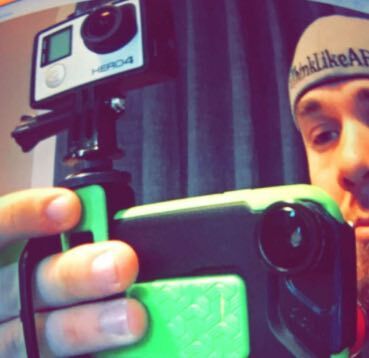 For this, I’m going to refer you to a list from Brian Fanzo, who does more live streaming from mobile than anyone else – Check out Brian’s list. 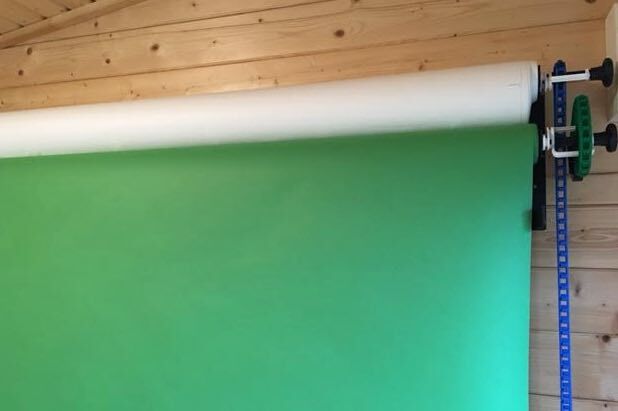 What about setting up a green screen? If you record with a green screen, some of the apps will enable you to change the background as you broadcast (e.g. Live Air). Here’s an example of Steve Dotto using green screen and replacing the background with a demo of an app (note this was not live). In our office, we set up a system where we can display a green screen or white screen when we need it. The backgrounds are on rollers so we just roll down the set up that we require. When you want to go live on Facebook, where do you go? Now that we covered the hardware equipment part of the Facebook Live setup, let’s see how you can actually start a broadcast. You can go live on your Facebook Page, profile or group on your mobile device. 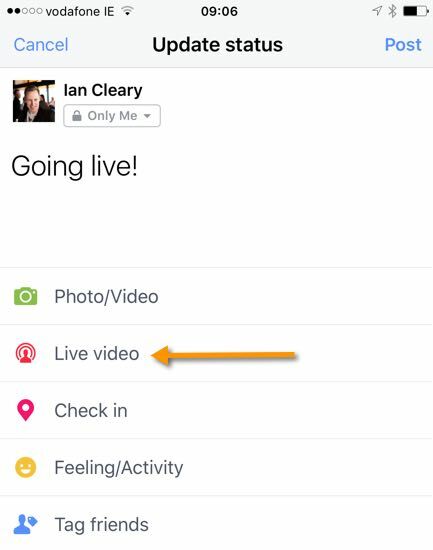 If you want to go live from a mobile device, you just open up your status update and select ‘live video’. If you want to go live on your Facebook Page, select the ‘publishing tools’ menu option on the top right of the Facebook Page, then select the video menu option and finally click the ‘Live’ button. 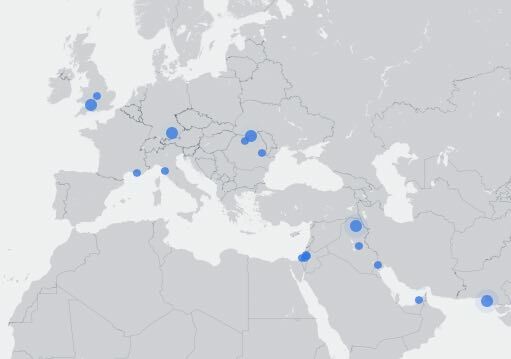 If you want to check out who’s live on Facebook at the moment, there is a map showing live broadcasts. Which software tools can you use to help with broadcasting? There is a wide range of tools available that will help you to go live by providing some additional functionality. RTMP stands for real-time messaging protocol. I’m mentioning it here because we’re going to start talking about tools. And for these tools to work with Facebook, they need to support RTMP. This is just a standard way of exchanging live information between two services. 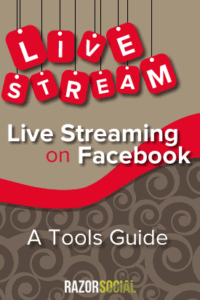 When you are setting up your tool to connect with Facebook, you’ll need to find out information such as the streamkey. This is a way of Facebook knowing who the data they are getting from other servers belongs to. We’ll explain more as we step through the tools and you’ll see the configuration that you need to set up. When you go live using Facebook, you are restricted in relation to what you can do. You can display the front camera and the back camera but that’s about it. Add layers – On the screen you may want to add on additional layers. For example, when you are broadcasting you may want your logo to appear or information about your show across the bottom of the screen. Show your desktop – Instead of doing a video of yourself, you may want to show your desktop. Add images – When you’re broadcasting, it might be useful to display an image at times. For example, if you have a deal for your product you could click a button and show this image. Multiple broadcasters – Facebook is testing out this functionality so you will be able to do this soon. You may want to have multiple people on Facebook Live from different locations. Recording – Automatically record what you are streaming. 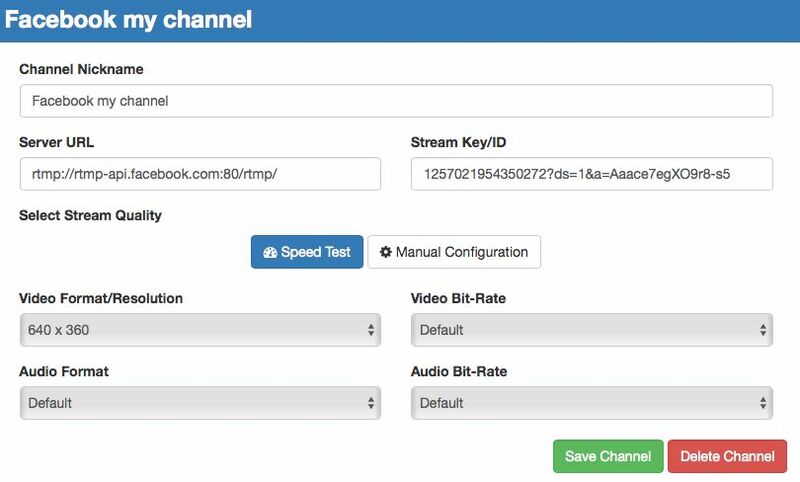 More advanced configuration – Facebook provides the default configuration for streaming live but you may want to adjust some settings. OBS (Open Broadcaster Software) is a free, open-source piece of software that you can use to broadcast to Live. There’s a lot of configuration you can potentially do with it but you can ignore a lot of the options. This is a desktop-based product. When you’re downloading OBS, you’ll have the option of Classic or Studio. Don’t select Classic because it doesn’t support Facebook Live! a) Get the stream key from your Facebook business page. To get your stream key, select the ‘publishing tools’ menu at the top of your Facebook Page and then select the Live button. You will then see a screen similar to the following, where you can grab the stream key for OBS. b) Add this in the settings for OBS. Make sure the service is set to Facebook Live because OBS supports streaming to other services too (e.g. YouTube). e) Click a button to go live on Facebook. The sound, video etc. all come from OBS and this is streamed to Facebook using RTMP (real-time messaging protocol). Facebook picks this up and broadcasts it to your Facebook Page. What functionality is available through OBS? If you were behind the scenes at a TV studio, you’d hear the production staff saying things like ‘Change to Camera 2’, ‘Cue the music’, ‘Change to camera 1’. You can do similar with OBS. Scene 1 – Video 1 & Audio 1 – You display one of the cameras on a guest and there’s audio available. Scene 4 – Still image – You have an image displayed before you go live. You get the idea… it’s pretty cool. You can see that, in the above, we have set up scenes (2) and sources (3). The scene selected is ‘My camera’ but there are multiple sources (3). There is a source to display the video, an audio source and there’s also ‘Footer’, which is an image we have added (3). As you can see, there are multiple scenes – including the desktop – that you can swap to. 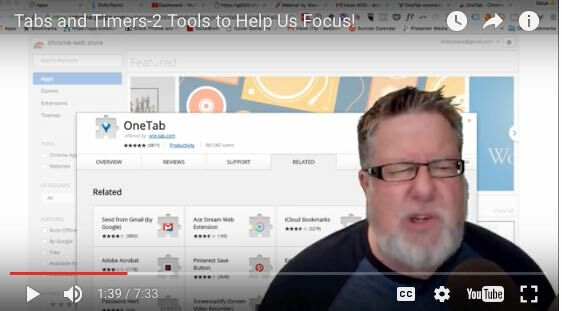 OBS to OBS – You can, in theory, connect one version of OBS to another and then stream to Facebook. For example, if you had someone remote you wanted to add in as a guest you could add them in as remote source. The problem with this is that, while RTMP is great, there would be a delay. File output (recording) to MP4, or FLV – Save your recording. You get a lot of great functionality for free and it works very well. I like it! 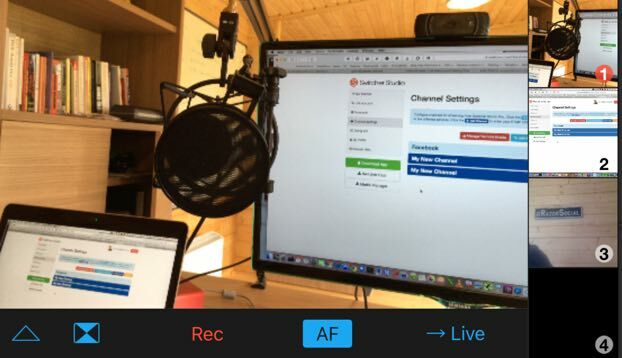 Switcher Studio is another useful Facebook Live tool which allows you to use your iPad or mobile device to broadcast live and, when you are live streaming, you can display your desktop or any other camera source that is on the same wireless network. Switcher Studio is installed on your desktop. Your mobile device sends information to Switcher Studio and that connects with other providers, such as Facebook. On the desktop, you connect Switcher Studio to your Facebook account so you can go live. 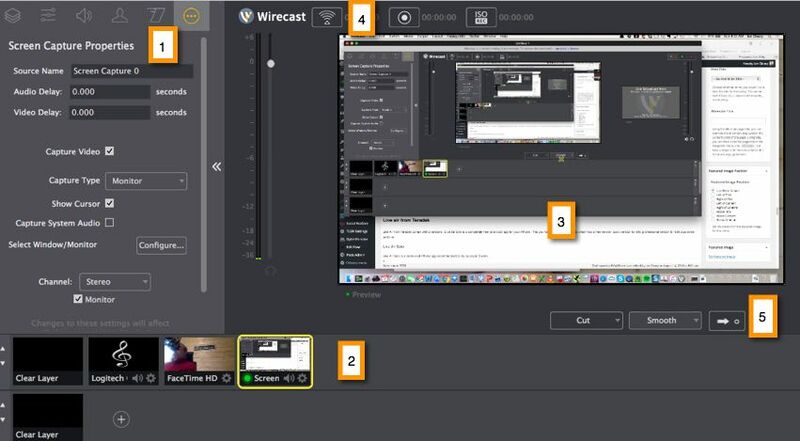 Switcher Cast is an app you install on your desktop that gives your mobile device access to your local desktop and any camera source that is connected to your desktop. This is the app you install on your mobile device. You live stream from your mobile device, not your desktop. When you install the app, you can use your device’s camera as a source but you can also add other sources such as a camera connected to your desktop. To add other sources (like scenes in OBS), you need to be on the same wireless network as that device. For example, I’m in my office at the end of my garden one source is my local camera but another source could be a camera in my house. With a click of a button, you swap between sources. This is what you need to configure! Link your Switcher account to Facebook using the Facebook menu option. 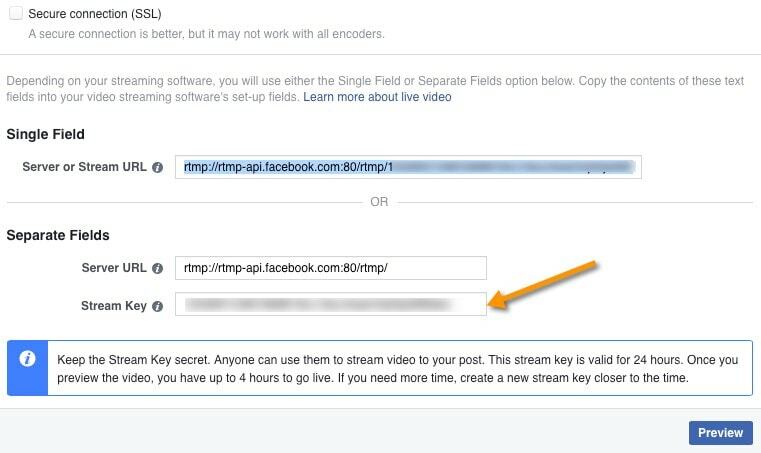 Set up your connection to Facebook for live streaming – when you want to live stream to Facebook, you’re going to need to get the server URL and stream key from Facebook (as shown earlier). You then copy this into the Facebook configuration. After you set this up, this is available for selection on your mobile device. Now swap over to the app. When you load up the app, you have a choice about whether it’s used as a remote camera or as ‘Switcher’. Select Switcher. Go to the outputs tab and select outputs source (scroll to the bottom of the page). Select the channel you just set up. Go to the inputs tab and select the inputs you want. 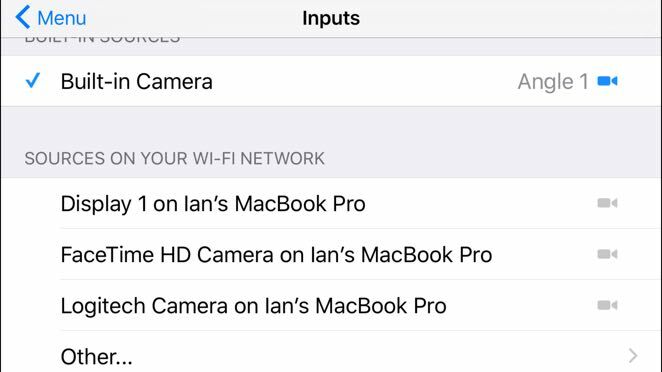 If you installed Switcher Cast (and it’s loaded), you’ll see options for your camera. Now, when you go back to the main screen, you’ll see your main source taking up most of the screen but you’ll also see the other sources you can swap to on the right. You can click the button to go live and also record. Switcher Studio needs to be simplified and better documented. It’s too complex for something that should be quite straight forward. It’s not a bad little app but it’s confusing to set up. 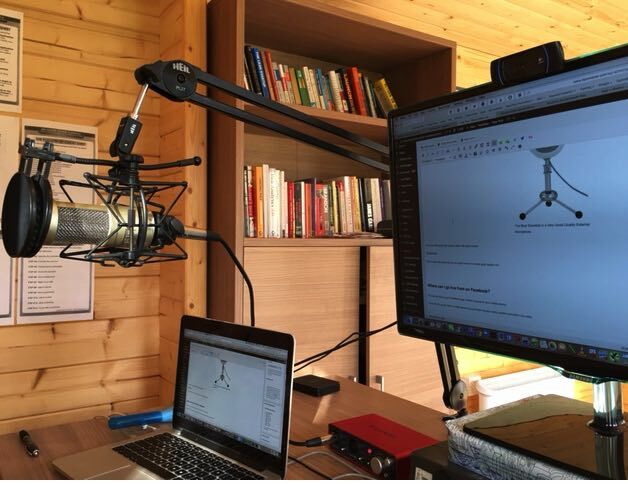 Wirecast is good software but it comes at a price – it’s $495 to buy it. You can try it out but only in a test environment because it makes annoying noises during your live event!! But the software is really great and there’s a lot you can do with it. This is where you do some configuration for what you are going to broadcast. For example, you could adjust the sound, or change the layout of the screen. You add your sources (e.g. image, video etc). When you click on a source, this what you want to go live with. When you want to change sources, just click on another of the ones you have set up. If you look underneath this, you’ll see there’s another layer you can add to the source. For example, you can have a video source and then have an image source that displays your logo on the video. This is the preview screen before you go live. This is the button to go live. This is the button you use (i.e. the arrow) to go from preview to live. Dynamic editing of sources – crop, resize, filter etc. Awesome software with great functionality. Out of budget for a lot of people but, if you have the budget, it’s worth it. Facebook Live doesn’t have enough functionality currently available so you need to use an external platform to get better production. This article covers a range of options for Facebook Live setup and gives you an idea of the available equipment for Facebook Live, both in terms of hardware and software. What other options have you considered or used for live broadcasting on Facebook?